External SSDs with a Thunderbolt 3 interface are still the only option for users looking to get high-end performance in a bus-powered portable device. These SSDs have become possible due to the emergence of NVMe drives in the compact M.2 form-factor, which are fully capable of saturating the Thunderbolt 3 interface, never mind slower interfaces like 10Gbps USB 3.x. The TEKQ Rapide was one of the first Thunderbolt 3 external SSD that we reviewed. Since it was fairly easy to disassemble, we also presented some benchmarks of a DIY Thunderbolt 3 SSD using the TEKQ enclosure and a SanDisk Extreme Pro M.2 NVMe 3D SSD. 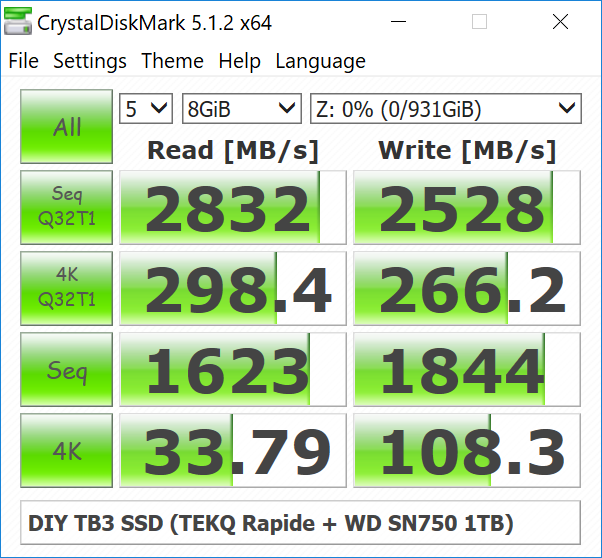 Now, since we happen to have Western Digital's WD Black SN750 SSD in, we decided it would be interesting to take a look at the new drive in a similar scenario. The TEKQ Rapide is a 98mm x 45mm x 12mm silver-colored external SSD with an aluminum chassis. It sports a single Thunderbolt 3 interface for both power and data. The port is enabled by the Intel DSL6340 Thunderbolt 3 Controller - note that this belongs to the Alpine Ridge family, and hence, works only with Thunderbolt 3 Type-C ports. On the other side of the DSL6340 is a PCIe 3.0 x4 connection that leads to a M.2 slot capable of accommodating M.2 2260 or 2280 PCIe SSDs. There are no plastic components in the chassis. There is nothing preventing advanced users from installing their own M.2 PCIe SSDs in the internal M.2 slot. The device is easy to disassemble, with four screws hidden under the rubber feet on the underside of the chassis. We took out the internal SSD (a Phison E7 reference design with Toshiba's MLC NAND) and replaced it with a 1TB version of the Western Digital WD Black SN750 M.2 NVMe SSD. The TEKQ Rapide enclosure includes thermal pads for both the M.2 SSD and the Thunderbolt 3 controller. As a refresher, the WD Black SN750 uses Western Digital's in-house controller and couples it with 64-layer BiCS 3D TLC flash. While the SSD itself claims transfer rates of 3470 MBps reads and 3000 MBps writes, the extent of throttling introduced by the TEKQ enclosure is not immediately evident. Evaluation of DAS units on Windows is done with the testbed outlined in the table below. For devices with a Thunderbolt 3 (Type-C interface) connections (such as the DIY TEKQ Rapide - WD Black SN750 TB3 SSD 1TB that we are considering today), we utilize the USB 3.1 Type-C port enabled by the Intel Alpine Ridge controller. It connects to the Z170 PCH via a PCIe 3.0 x4 link..
Western Digital claims read and write speeds of 3470 MBps and 3000 MBps respectively, but our standard ATTO test trasnfer sizes and lengths do not back up those numbers. 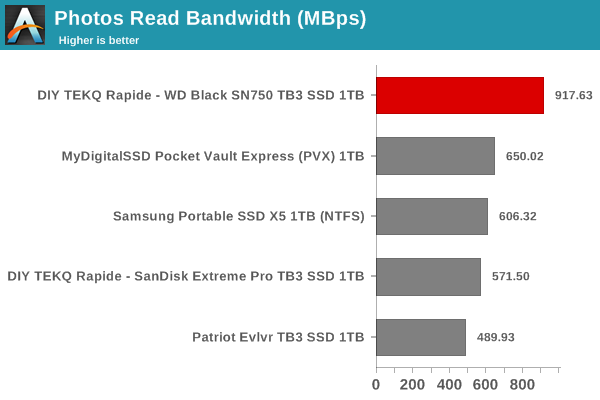 In fact, these numbers are very close to what we obtained with the SanDisk Extreme Pro SSD. In any case, these access traces are not very common in real-life scenarios. CrystalDiskMark, despite being a canned benchmark, provides a better estimate of the performance range with a selected set of numbers. As evident from the screenshot below, the performance can dip to as low as 33 MBps for 4K random reads. The sequential access numbers are slightly better than the SanDisk Extreme Pro. 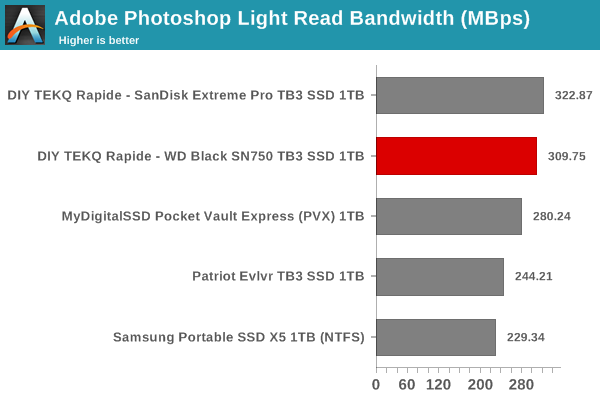 In general, we find that the WD Black SN750 tracks the performance of the SanDisk Extreme Pro, but, delivers improvements in key workloads that are more representative of direct-attached storage use-cases. Yet another interesting aspect of these types of units is performance consistency. Aspects that may influence this include thermal throttling and firmware caps on access rates to avoid overheating or other similar scenarios. This aspect is an important one, as the last thing that users want to see when copying over, say, 100 GB of data to the flash drive, is the transfer rate dropping to USB 2.0 speeds, if only momentarily. In order to identify whether the drive under test suffers from this problem, we instrumented our robocopy DAS benchmark suite to record the flash drive's read and write transfer rates while the robocopy process took place in the background. For supported drives, we also recorded the internal temperature of the drive during the process. The graphs below show the speeds observed during our real-world DAS suite processing. The first three sets of writes and reads correspond to the photos suite. A small gap (for the transfer of the videos suite from the primary drive to the RAM drive) is followed by three sets for the next data set. Another small RAM-drive transfer gap is followed by three sets for the Blu-ray folder. An important point to note here is that each of the first three blue and green areas correspond to 15.6 GB of writes and reads respectively. Throttling, if any, is apparent within the processing of the photos suite itself. In the whole duration of the test, the temperature of the SSD never passed 45C. Our DIY configuration doesn't exhibit any thermal throttling. The comparison between the SanDisk Extreme Pro DIY configuration and the WD Black SN750 shows a marked improvement in the transfer of the set of photos. Other than that, the consistency aspects are similar. The performance consistency for real-world applications was looked at in the previous section. We recently added a test to determine the effectiveness of the thermal solution for sustained workloads. 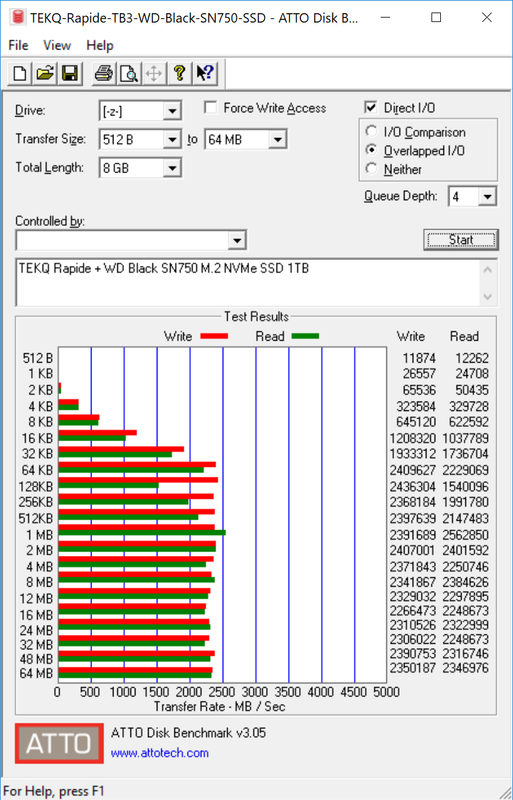 After deleting the SSD volume, a fio workload was set up to write sequential data to the raw drive with a block size of 128K and iodepth of 32 to cover 90% of the drive capacity. The internal temperature, instantaneous write data rate, and total amount of data written in total till that point of time were recorded. Three key aspects stand out - for our fio workload, the WD SN750 can go beyond 2000 MBps in the SLC cache region, while the SanDisk Extreme Pro topped out slightly north of 1800 MBps. The latter could sustain only around 1400 MBps in the steady state, while the WD Black SN750 stays at 1500 MBps right through the workload. 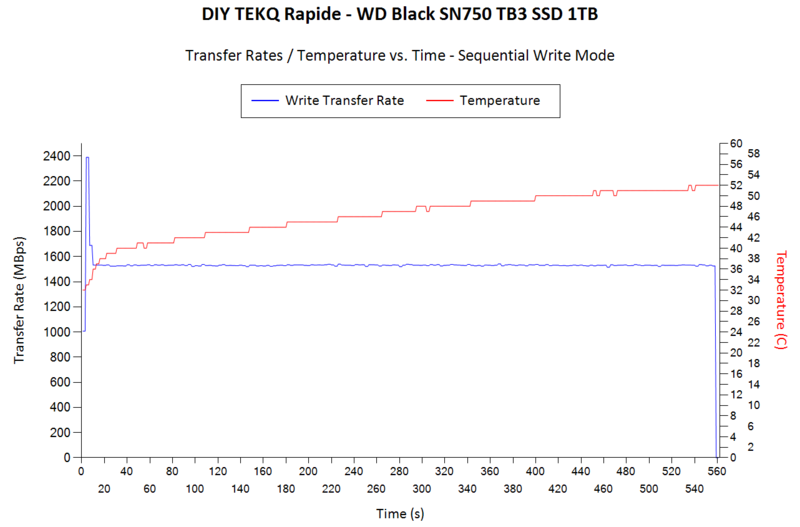 Finally, despite the higher sustained write performance, the WD Black SN750 reached only 52C at the end of the test, while the SanDisk Extreme Pro topped out at 57C. The above exercise also allows us to determine the SLC cache size and/or the amount of data that can be written in one shot without a drop in the write data rate. The graphs below plot the transfer rate and the total data transfer amount from the start of the fio workload to the approximate timestamp at which the transfer rate shows a significant drop. 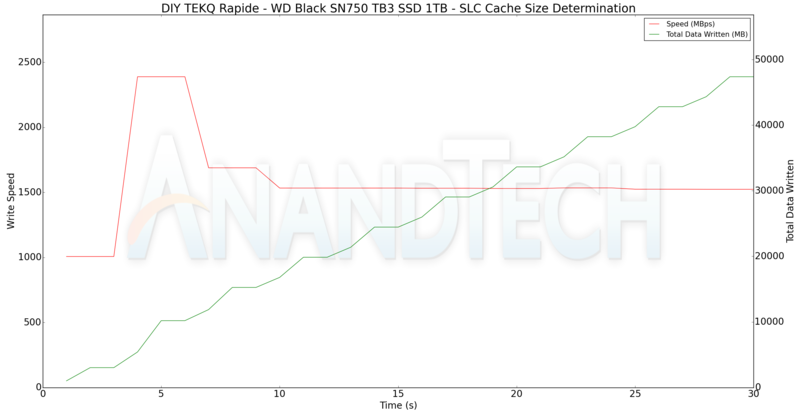 The SLC cache size on both the SanDisk Extreme Pro and the WD Black SN750 seem to be around 15 - 17 GB for the 1TB model. The peak power consumption of a bus-powered Thunderbolt 3 device can't go beyond 15W. However,it is still relevant to take a fine-grained look at the power consumption profile. Using the Plugable USBC-TKEY, the bus power consumption for the DIY TB3 SSD was tracked while the CrystalDiskMark workloads were processed. The workloads were set up with an interval time of 30s. 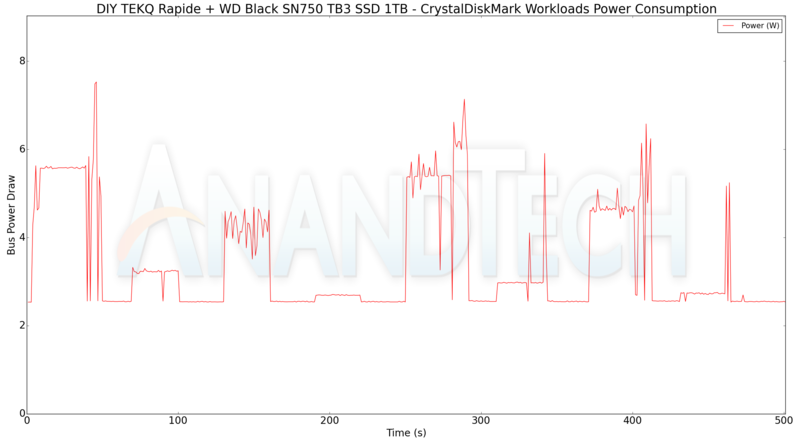 It is interesting to note that the SanDisk Extreme Pro has many peaks close to the 8W mark, while the WD Black SN750 tops out around 7.8W, and that too, only very briefly. 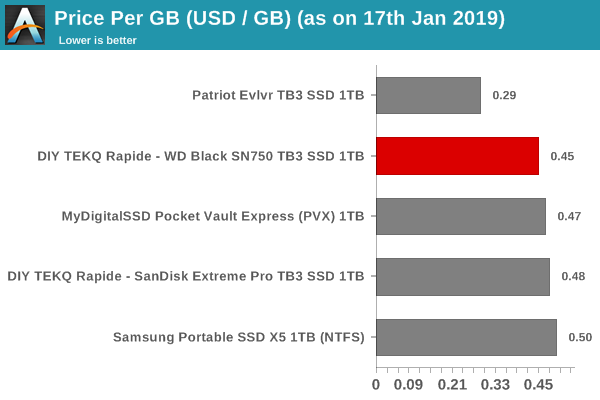 Moving on to the pricing aspect, the most cost-effective TB3 1TB SSD is currently the Patriot Evlvr, but it comes with a PCIe 3.0 x2 NVMe SSD internally. 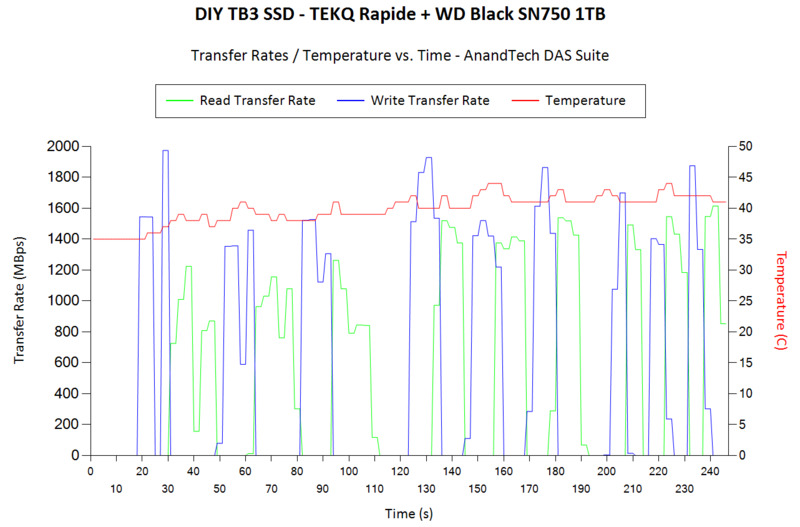 Our DIY configuration (taking out the cost of the internal SSD from the lowest-priced TEKQ Rapide) comes next, which is a huge surprise given the gulf in performance compared to the other SSDs that we are comparing against. The 1TB WD Black SN750 is retailing for around $250. We may soon have standalone Thunderbolt 3 SSD enclosures from TEKQ for around $162 to aid the DIY community, but that is not the pricing assumed in the table below. Coming to the business end of the review, the WD Black SN750 makes for an excellent Thunderbolt 3 SSD. Despite only being a firmware upgrade to the SanDisk Extreme Pro M.2 NVMe 3D SSD / 2nd Gen WD Black NVMe 3D SSD (2018), the drive delivers key performance improvements for typical direct-attached storage workloads. In fact, our tests show that the configuration manages to surpass many off-the-shelf Thunderbolt 3 SSDs in both performance and value aspects. We have absolutely no reservations in recommending the SSD for use in a Thunderbolt 3 SSD enclosure. First of all calling TB3 Firewire 2 is insane. You can get an M.2 40Gbs T3 enclosure now for £106 from i-Tec.